Early surf out in the canoe (boat) to get right out the back quickly and easily. Long wait for not many waves. Moved further in but not much there either. Storm approaching and worried about the three hour boat trip. Decided to go back to Lata today to make sure that I connect with the flight early on Tuesday morning. Pack everything in a way that may best handle getting my bags wet. 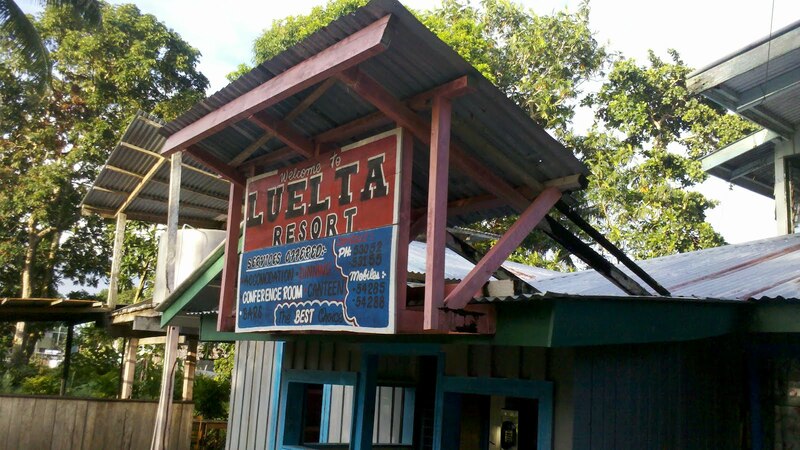 Make it to Lata and move in to the Luelta Lodge. Woke to rain easing after heavy thunderstorm overnight. Surf was small and frustrating and the various bits of the wave were not connecting. Church may have stopped anyone else from surfing today. No-one suggested to me that I should not surf and I did not see any signs of a church service. Yet another small storm blew through at noon. 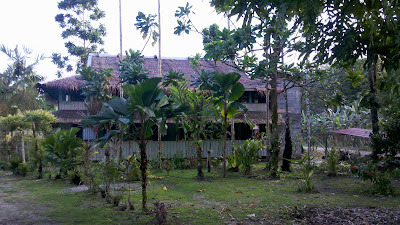 Afternoon walk to track down the sugar palm board and to photograph it and its builder. Walked to the point, made more sense than going there by boat. High tide, waves a bit full at take-off for a change. A couple of teenage locals out trying to catch waves with dugout canoes. Saw how to bale a canoe out that was completely swamped. It is quick and easy, a rhythmic shake and make a wave inside the canoe that breaks out of it. Watching the storm build out to sea and head toward me. No lightning in it so I don't have to run from it. Eventually the whole of my vision of the sky when facing north east is the deepest black. Any reflection of the sky on the smooth water completely went away and my full field of vision is straight into the clear water seeing the coral clearly and the occasional little fish swimming very near the surface. An awesome sight! Next the rain started and I paddled in and walked back in a torrential downpour, past the school (disrupted most of the classes in the process). Early surf, swell has dropped some more. Heavy rain overnight easing to light rain before the surf and on and off until lunch time. Solar recharging failure from the cloud cover today. I got a clear indication of the swell direction by watching the swell to the east of Nave. The left hand break in this photo is there but not really ridable, at least on any day I looked at it. The right handers are slightly better than they look in this picture. Morning surf session with the swell a little smaller than yesterday. Getting cocky with some rides ending in noserides on ankle to knee-high waves over coral. Tides are lining up nicely with the morning and afternoon session and the current is not a problem. This could also be due to the swell direction being less east and more north. After surfing we head up the hill to a couple of hundred meters above sealevel to unblock the village water supply. Watson tells me what he knows about other people who have surfed the place and the names of the two breaks. Temotu lite, the left has the same name as the little island next to it. Woke to HEAVY rain that stopped about 9am. Straight out to Nave. Canoe had a motor failure, screw loose. Paddled the canoe out and back at the end of the session. Sitting out the back I had the thought: Wow that is an active volcano just out there. 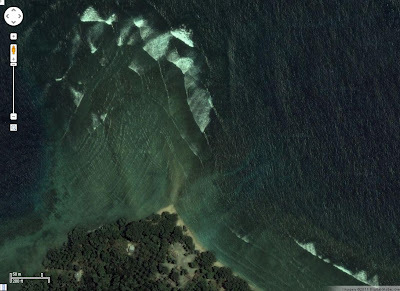 The next surfer to the east of me is surfing in Fiji. The nearest one to the west is probably in Malaita Province and to the south Vanuatu. 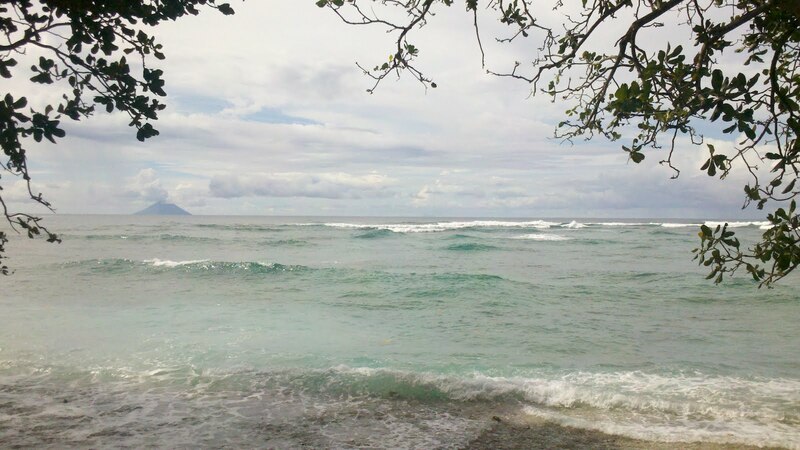 To the north either Pohnpei or Kiribati. Wow I have escaped the crowd! Because of the rain in the morning the "seabreeze" did not kick in so I had another surf session at 3:30pm. School was out so the break also had 4 dugout canoes and 10 kids in the water. I remembered the thought I had this morning. The heavy rain has stuffed up the gravity fed water system. This was forecast to have the best surf of the whole trip, so an early start. The previous session on Saturday had enough current to push me out of position by the time the next set arrived. So I urgently needed to work out a method of staying in the right place way out here. Paddle out until you are where you want to be in relation to the breaking wave. Look straight down into the water and note the pattern on the bottom, especially the bright white blotches (could be quartz). Stay on top of that pattern for as long as it takes for the next wave the right shape and size to come through. 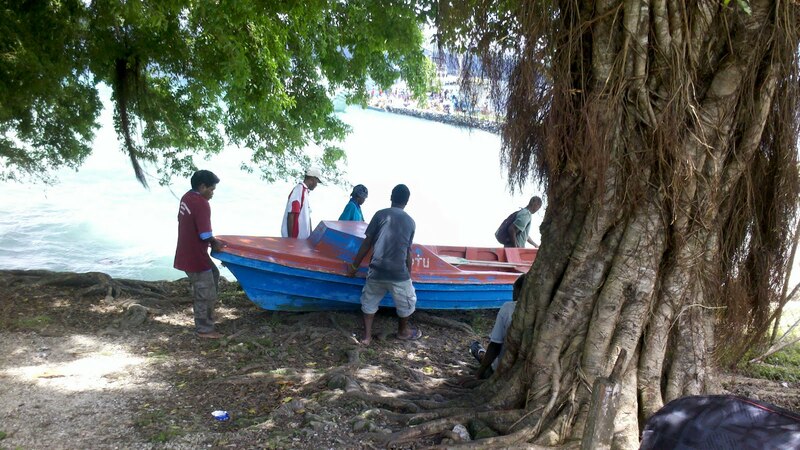 Flight in to Lata Airstrip from Honiara then a three hour "canoe" (see picture) trip east to Kalabay (Carlisle Bay). Afternoon surf at a spot I later found out was called Nave. The combination of the direction of the swell and the incoming tide meant that movement away from the break was a problem.